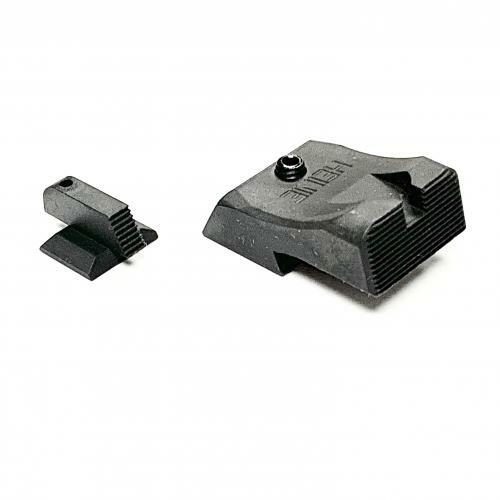 SlantPro Black Sight Set for Dan Wesson - Heinie Specialty Products, Inc. Designed specifically for the Dan Wesson 1911 and Commander pistols, this set features our rear SlantPro design. The SlantPro style rear sight is designed with concealed carry (EDC) as its primary focus. The sight is contoured and completely snag free. The rear face is serrated and slightly slanted forward to help eliminate glare from any light source. This SlantPro sight set has serrations and all black providing a no fuss, no distraction sight picture. Minor fitting of the front and rear sight is required for installation but does not require modification to your slide. Blued finish, rust preventative is recommended.